In what may be the first public accounting of the actual supply and demand of media compiled directly from the data processing systems of major agency holding companies, television is showing incredible resilience as Madison Avenue’s alpha medium. Despite the hyper-fragmentation and onslaught of new media options, TV took nearly two-thirds (62.4%) of all the ad dollars spent by major agency holding companies during 2012, according to data provided to MediaDailyNews by Standard Media Index. The data, which comes directly from the systems used by four of the Big 6 holding companies -- Aegis, Havas, Interpublic and Publicis (see Wednesday’s story) -- is the most empirical view yet of actual media-buying behavior among major ad agencies, because it is based on their actual buys, not the kind of estimates supplied by third-party syndicated researchers or industry analysts. It shows that overall demand for television remains constant, with total TV ad dollars rising 6.5% during 2012, about the same rate of expansion (6.9%) as the total ad dollars spent by those agencies that year. 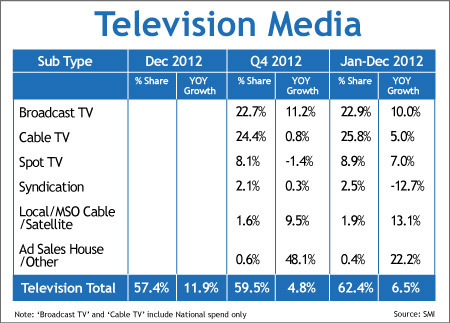 Even more interesting patterns begin to emerge when you drill into specific sectors of the TV advertising marketplace (see table below), including the fact that demand for broadcast network television was among the strongest, with broadcast network ad spending rising 10% over 2011. Much of that incremental growth no doubt was attributable to NBC, which aired the London Olympic Games during the third quarter. Advertising buys on NBC rose 51% over 2011, making it the only broadcast network other than Spanish-language broadcaster Univision (+10%) to show any growth last year. Ad buys on CBS were flat, ABC’s declined 1% and Fox’s declined 5%, according to the SMI data. While most other sectors of television showed healthy growth in 2012, one, syndication, declined precipitously, falling 12.7% from 2011. The decline in advertising buys in television syndication does not correspond with any loss of audience share among the major television syndicators, but it does follow the loss of a major, high-demand, and likely high-dollar source of advertising buys: “The Oprah Winfrey Show,” which went off the air in September 2011.